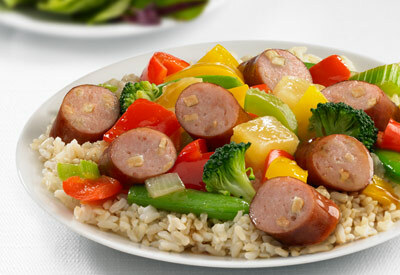 Smoky apple chicken sausage, fresh vegetables and sweet pineapple are combined with a sweet and sour sauce to create a delicious rice dish. Drain pineapple; reserve pineapple chunks and juice. In a large skillet, saute vegetables in oil until crisp-tender. Add sausage and pineapple chunks; cook and stir until heated through. In a small bowl, combine the cornstarch, water, soy sauce, brown sugar and reserved pineapple juice. Stir into sausage mixture. Bring to a boil. Cook and stir for 1 minute or until sauce is thickened.